Hi Everyone, today we're helping out Mary from Mary's Meanderings. 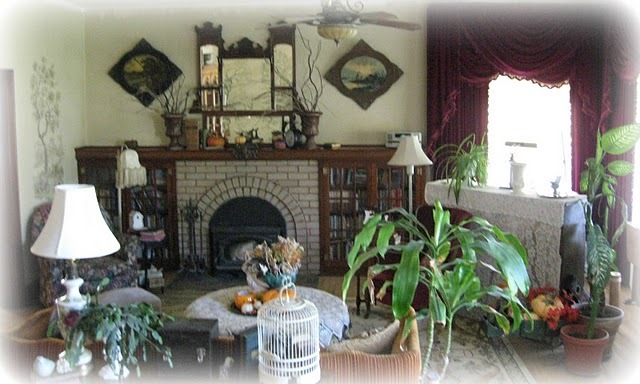 She has a lovely Victorian Living Room that she will be updating soon. 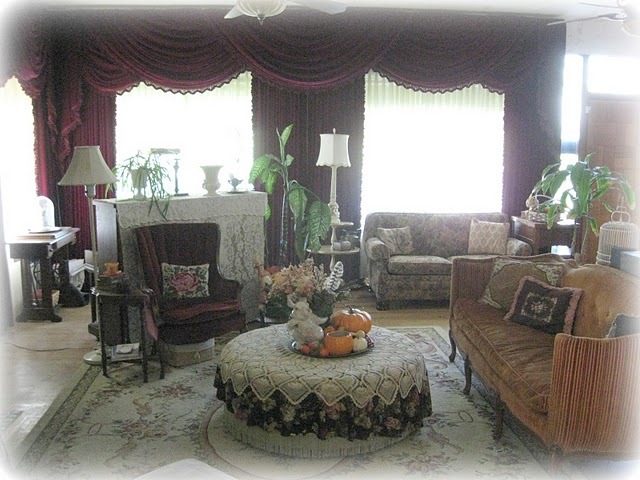 Mary has a large space with lots of furniture, which brings with it some decorating questions. Let's help her out with some ideas and inspiration. Don't get overwhelmed with all that Mary wants to do. Just pick one or two things you'd like to comment on. 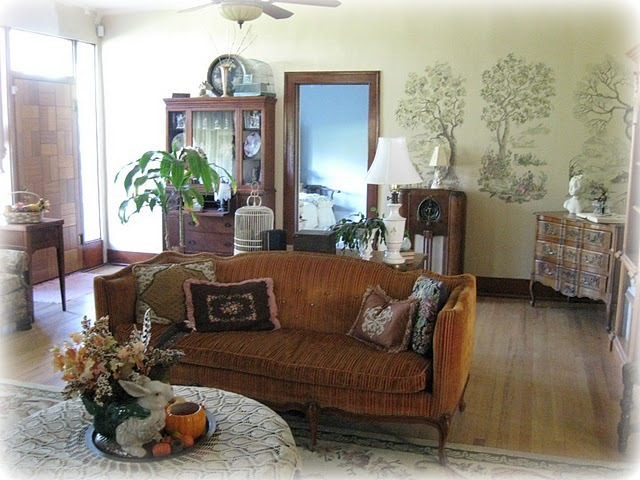 We are blessed to live in an old (approx 100 yrs old) home. It has lots of character and many quirks too. When Debra at Common Ground started her Design Challenge series I just knew that I wanted to be a part of it as I love reading all the great ideas you ladies come up for decorating challenges. My design challenge right now is our living room. It is a large room with pretty wood trim and we spend winter in this room as it has a wood burning stove which is our primary source of heat. Therein lies one of the problems. That fireplace and mantel is off centered in this room which makes seating arrangements troublesome for me. Before I go much further let me show you the room so you can get an idea of the needs. 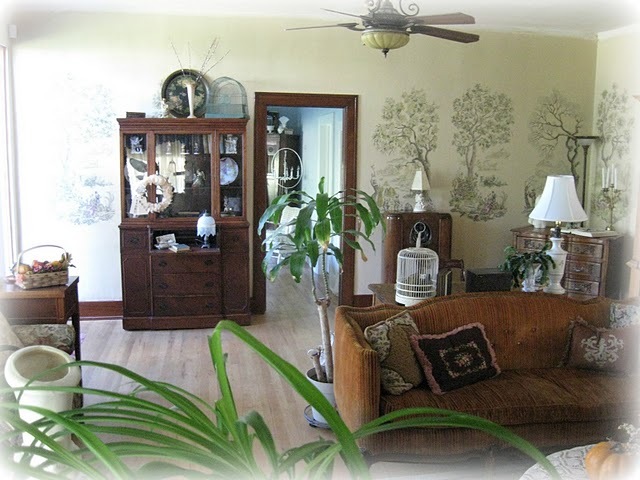 Picture 3 is the next wall which has 2 more massive windows (the window coverings were in the house when we bought it. When we took the ceiling wallpaper down to rewire the house we found that they had remodeled this room Dec.1, 1950 (it is written on the ceiling along with the decorator’s names ) Supposedly the owner spent $5000.00 to have these window treatments made which was a lot of money then- geez it’s a lot of money now to me!) To the right of the windows is the front door. It is the north wall so the light that comes through is not bright as such. East Wall- for those of you wondering , the wallpaper is murals of the 4 seasons in Victoria era. It will be coming down and walls painted. Picture 4 is the wall opposite the fireplace (the East Wall)- The door leads to the pretty front guest bedroom I redid this spring. It could also go on the wall shown in Picture 1- where the book case is. 3. be nice to have more of an entry way feel at front door. 4. The desk behind the settee was so useful last winter for blogging and would like to maybe use it again somewhere in the room if possible. 5. I will be painting this room in the Spring and would love some help on color choices. The trim will be kept stained though I would love to paint it (have to make DH happy too). The window treatments will also be staying. The rooms windows are to the north so with the dark fabric I would like to give it a lighter look which might not be possible. 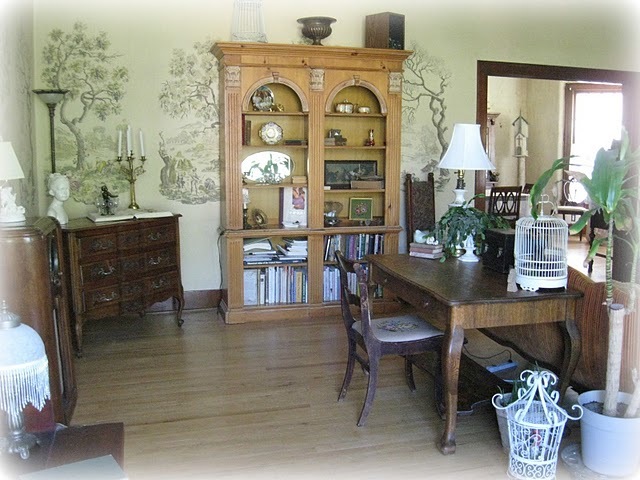 6.This room adjoins the dining room which also will be getting painted – should I paint both rooms the same color? 7.Oh- the wood floors are a lighter color then the stained woodwork- should I do something different to the floors or woodwork or would an area rug or 2 work to pull it together and if so suggestions. 8.The Victorian style sofa will also be undergoing a new look- slipcover? Upholstery? What kind of fabric? 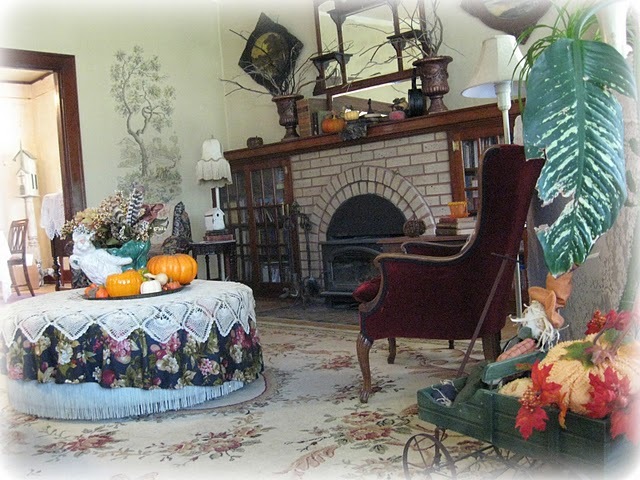 I have 2 wing back chairs that I can borrow from another room and I am sure some of these items will not fit in a new arrangement though I would like to keep the piano, round ottoman and have a desk area too. Oh geez can you see just what a bucketful of decisions I need help making!!!?? Well dear ladies I could just go on and on with all the questions I have for all you amazing bloggers but will stop for now and wait for all your heavenly suggestions!!! Thank you so very much for taking the time to give me your suggestions and ideas! Thank you Debra for giving me the opportunity to to be of this great Decorating Challenge!! You're very welcome, Mary. Thanks for sharing your lovely home with us for Design Challenge! Now it's blogland's turn. You don't have to be a decorator to leave a comment. Please just go with your intuition. That is what a designer would do. They listen to the client, then they present their own ideas. So let's share our thoughts and ideas for an update with Mary. Keep in mind her ideas, but don't be afraid to share your own. Hi Mary, This is somewhat of a difficult dilemma. I'm going to suggest two different seating areas. Take everything out of the room so you can edit. I'd bring in the two wing chairs for either side of the fireplace creating a cozy spot, turn your larger sofa around. I'd try putting the writing desk behind the sofa again, but this time in the Fireplace area. For your armoire I'd place it where the bookshelves are, but I think I'd try angling it in that corner first to see how it worked. This would be your second seating area. If you have to keep your window treatments then I'd go with a grayish putty color that compliments the fireplace and the draperies. But if you can let go of the drapes I think you'd have a spectacular space. Draperies now do not cost an arm and a leg, and I think less is always more when it comes to window treatments. Unifying your sofas and chairs with slipcovers in an oatmeal or natural linen-like material would be what I would do. Then accent with a variety of pillows and patterns. Visually there's a lot going on in here. Painting will help tremendously. Because this is such a large room with so much light I think you can use a medium hued paint no matter what. Hi Mary, I also think the room would look a lot bigger and lighter with just drapery panels on the windows. Maybe you could use the drapes in another room. I would move out the small sofa and bring in the two wingbacks. Use a neutral color on the walls in both this room and the dining room. Love the armoire and the French chest. Best of luck. Those tablecloths are gorgeous. The 1st one is so elegant, and the third one is so shabby chic. Well, this are great inspiration photographs. Planting in room is best for pure breath. Hi Mary, me again. I think that the main theme in the comments has been "simplify". Unifying furniture with slipcovers, painting the walls a nice neutral color, taking that big step to free those windows up with lighter drapery panels and sheers or shades. Also editing and creating intimate seating areas will help too. You have a wonderful large space. 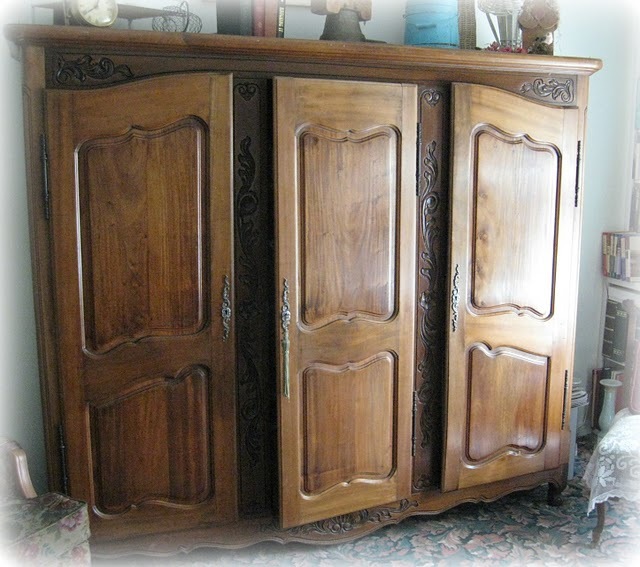 I have to say I'm so envious of that amazing armoire. It will be a wonderful addition to that room! I can't wait to see how it all turns out, please let us see your results! Debra, Yes I think the word "simplify" is it! Thank you Richard for helping me see the different styles that is going on with the furniture- The comments have given me much to think on and I thank everyone for their help!